Description: Since the advent of the Internet, most of our friends, family, and clients have become global publishers, copying and repasting copyrighted works of others on a daily basis. At the same time, contemporary art has skyrocketed in economic and symbolic importance in modern society, with a greatly expanded collector base. Changing media, modes of production, and a general lack of transparency in the art world have created a special realm of problems for both casual participants and seasoned art world veterans alike. Ray Dowd, author of Copyright Litigation Handbook (West 2010), teams up with New York and L.A.-based fine art attorney Amy Goldrich to provide the tools necessary to advise clients navigating these issues. My friend Jordan Bayne is finishing a film called The Sea Is All I Know using an innovative financing method that allows friends to participate in the project. This is a great project and a great way to support it. The Federal Judiciary has released an assessment of the PACER service, find it here. Although the video touts the availability of Digital Audio files, according to PACER's website, only a few courts have made the service available, and the recording is only available if the presiding judge decides to post it on PACER. Digital audio recordings are now available to the public via internet access to the PACER system. In March 2010, the Judicial Conference approved the plan to make digital audio recordings available on PACER after a two-year pilot project showed significant public interest in accessing these files. Prior to the pilot, access was only possible by obtaining a CD recording from a court clerks office for $26. The new digital files cost $2.40. The presiding judge determines if the audio recording will be posted on PACER. Digital audio recording is used in most bankruptcy and many district courts (where magistrate judges account for most of the usage). The following seven courts provide access to audio files through the PACER system: the U.S. District Courts in Nebraska and the Eastern District of Pennsylvania; the U.S. Bankruptcy Courts in the Eastern District of North Carolina, Northern District of Alabama, Southern District of New York, Rhode Island and Maine. Having more courts participate and making it an "opt-out" system would make PACER truly revolutionary in digital audio recordings and be a tremendous money-saver. From the assessment, it looks like a number of good new changes are coming to PACER. It is amazing to see that PACER grew to over a million accounts by the end of 2009. Join our discussion to learn about current developments in decisions of the Trademark Trial and Appeal Board. This session will go over a variety of TTAB decisions covering commonly encountered issues such as: likelihood of confusion, identification of goods, descriptiveness, genericness and functionality. Our speaker, Ted Davis, is a sought-after authority on trademark law and has extensive experience in trademark and unfair competition law and was recognized as a 2010 Georgia “Super Lawyer” for Intellectual Property and Intellectual Property Litigation by SuperLawyers magazine. He is a regular lecturer at the International Trademark Association’s annual meeting, which he has represented in several amicus filings before the United States Supreme Court. 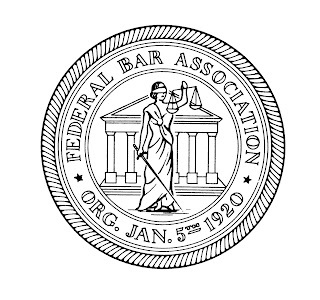 Who Should Attend: The program is open to all and membership in the Federal Bar Association is not a requirement. The program is especially suited to: in-house and outside counsel, CEO's, brand owners, business owners and their representatives who are concerned about IP protection and counterfeit goods and trademark portfolio managers. CLE - Locke Lord Bissell & Liddell LLP has been certified by the New York State Continuing Legal Education Board as an Accredited Provider of CLE in the state of New York from 2009 to 2012. Attendees will receive a maximum of one (1) credit hour, of which 0 credit hours can be applied toward the "Areas of Professional Practice" requirement. Locke Lord Bissell & Liddell LLP (LLBL) is dedicated to providing high-quality continuing legal education to attorneys interested in its course offerings. Towards that end, LLBL has a financial hardship policy for attorneys who are unable to afford the course tuition but are interested in continuing legal education courses offered by or in conjunction with LLBL. Attorneys that are unemployed are eligible for a full scholarship. Attorneys with an annual income up to $35,000 are eligible for a tuition discount of 75%, attorneys with an annual income of $35,000 to $50,000 are eligible for a tuition discount of 50%. Attorneys with an annual income above $50,000 are not entitled to a discount. In Re Therese Pearman, 432 B.R. 495 (D. New Jersey June 23, 2010) struggled with precisely this issue. Ms. Pearman wrote a poem grieving her grandparents' death. It was entered in a national competition and won. Then her poem was published in "Chicken Soup for the Christian Soul". She complained and was paid a $500 licensing fee. Years later she found out that someone else was using her poem. She sued for copyright infringement. But it turns out that someone else wrote the poem in the 1960s. The accused infringer turned around and sued her demanding sanctions. She declared bankruptcy. In analyzing whether the claims against her were dischargeable in bankruptcy the court analyzed first whether or not her actions were willful. The court concluded that they were. But the court then went on to the second portion of its analysis in determining whether the alleged debt qualified as an exception to discharge in bankruptcy. To qualify for the exception the injury must also be "malicious". The court found that the injury was not malicious and thus did not qualify as an exception to discharge in bankruptcy under Section 523(a) (6) of the Bankruptcy Code. So the answer is "sometimes" and a higher "malice" standard must be satisfied. See In re Barboza, 545 F.3d 702 (9th Cir. 2008). Dunnington, Bartholow & Miller, LLP, a leading New York City-based law firm established in 1921 that provides services including trusts and estates, corporate, taxation, litigation, real estate, construction, intellectual property and art law announced today that litigation partner Raymond J. Dowd was named General Counsel of the Federal Bar Association (FBA), the premier bar association serving the federal practitioner and the federal judiciary. 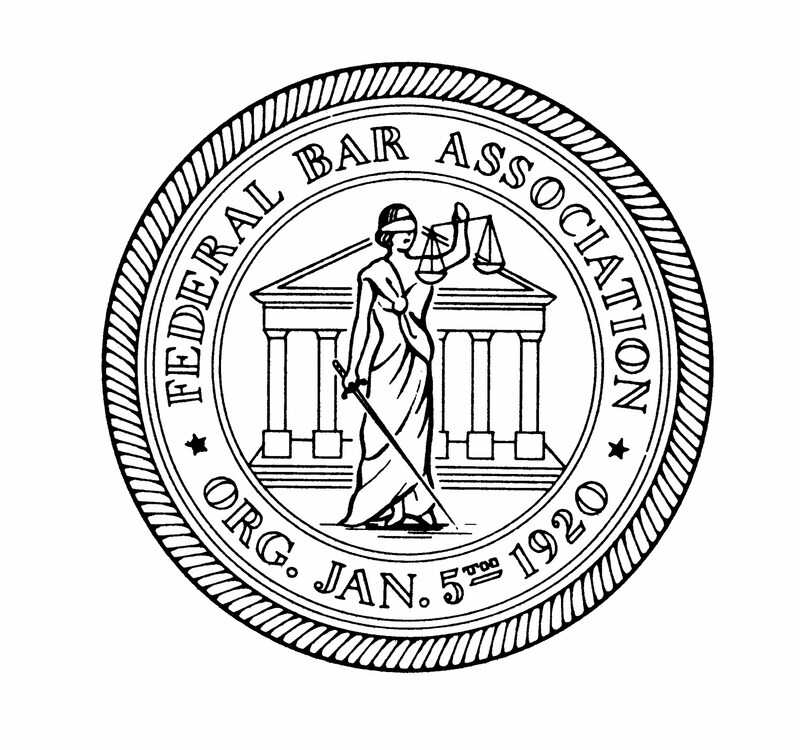 Mr. Dowd, who currently serves as the FBA’s Vice President for the Second Circuit, was appointed last week as General Counsel at the New Orleans annual convention. Mr. Dowd served as President of the FBA’s Southern District of New York Chapter and sits on the Editorial Board of The Federal Lawyer. “At Dunnington, we have a proud and long-standing tradition of volunteerism and support of our local and national bar associations. We are very proud that Ray has been named General Counsel of the FBA,” said Carol Sigmond, the firm’s administrative partner. Mr. Dowd’s litigation practice recently garnered national attention with a victory at the Second Circuit Court of Appeals. 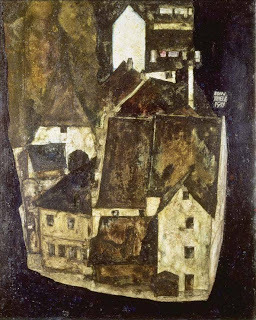 In Bakalar v. Vavra, Mr. Dowd represented descendants of Holocaust victims in recovering Nazi looted art, successfully arguing that New York law should trump Swiss law in determining title to stolen artworks. An experienced federal and state litigator, Mr. Dowd’s victories include summary judgment and a bench trial in trademark and unfair competition claims over the use of FASHION TELEVISION and litigation involving the estate of heiress Doris Duke, including removing the corporate fiduciary U.S. Trust Co. and upholding a $100,000 trust for her dogs. Mr. Dowd has repeatedly been named a New York Superlawyer and is active in the Copyright Society of the U.S.A. and New York County Lawyers’ Association. He is author of Copyright Litigation Handbook (5th Ed. 2010), a Thomson West publication, the Copyright Litigation Blog, and is a former contributor to the New York Law Journal. The firm was established in 1921 in New York City and provides a broad range of legal services to individual and corporate clients. For more information, visit http://www.dunnington.com/. The FBA is the premier bar association serving the federal practitioner and judiciary. For more information, visit http://www.fedbar.org/. How does one research a Nazi art looting case? Coverage of the Bakalar v. Vavra case and interview with me in the wake of my victory for the heirs of Fritz Grunbaum at the Second Circuit at the West Reference Attorney Blog under the heading "A Thief Cannot Pass Good Title" here. I met a number of West Reference Attorneys when I took a tour of the West HQ and printing plant in Eagan, MN. They are a great group, check out their blog for the latest topics in legal research/news. More on Fritz Grunbaum and the theft of artworks from him when he was in the Dachau concentration camp here. For a translation of the Second Circuit's Bakalar v. Vavra decision into German, go here. I am co-hosting an evening at the Museum of Jewish Heritage on October 6 for Sustaining Members of the New York County Lawyers' Association. If you are not a Sustaining Member, sign up now! I cordially invite you to join me at The Morgenthaus Exhibit at the Museum of Jewish Heritage, and to a private reception on Wednesday, October 6, 2010 from 6:00PM-8:00PM (reception 7:00PM). Our special guest will be Robert M. Morgenthau. The Museum is located at 36 Battery Place, New York, NY (click here for directions). The support provided by Sustaining Members like you makes much of what we do possible, and assures that NYCLA has a strong voice when we collectively speak out on all the vital issues that affect the bar and the public. Thank you for contributing to over 100 years of excellence at the Home of Law. The Morgenthaus have embraced the promise of America since their arrival in 1886. Wanting to contribute to their country and their communities, they dedicated themselves to public service. The exhibition tells the story of three generations of this family, and explores the fascinating ways in which their services to others changed the course of world events, American politics, and Jewish history. We just compiled the comments from Tuesday’s program and as you can see you got rave reviews. The headless woman who invaded my life five years ago, a well-known fixation of mine known to readers of the Copyright Litigation Blog. She is pretty much single handedly responsible for me learning a great deal about Nazi art looting and adding that dimension to a blog that started out with other intentions. People seem to like the mix! Article from NYLJ on Second Circuit reversal in Bakalar v. Vavra here. More on the litigation and Bakalar v. Vavra decision here. More on Nazi art looting here. More on Fritz Grunbaum and other artworks stolen from him here. Copyright Law: Analysts' Opinions Copyrightable, Not "Hot News"
Sometimes your case is a winner, but not for the reasons you thought. That's why litigators, much to the frustration of judges, tend to toss the kitchen sink into a complaint. Better to have a grouchy judge and have pleaded at least one winning alternative theory than to lose and have the court say you're too late and should have cooked up an alternative theory earlier. Such was plaintiff's dilemma in Agora Financial LLC v. Samler, ---- F. Supp.2d ---- 2010 WL 2899036 (D. Md. June 17, 2010). In Agora, a magistrate judge was called to report and recommend after a defendant had defaulted. 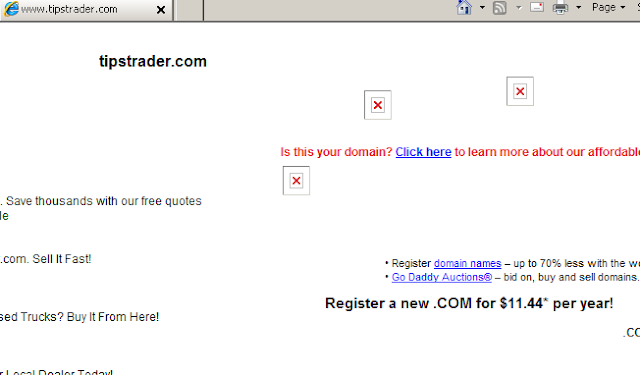 The facts: investment newsletter publisher sued website that culled all of its recommendations and published them on Tipstrader.com. Claims? "Hot news misappropriation" and Section 43(a) of the Lanham Act. A nice, lean complaint, just like they tell us to file. Right? Wrong. In an interesting decision that explained the "hot news" misappropriation claim, the court ruled that the defendants had not violated the "hot news" exception because the analyst recommendations were opinions, not facts, and thus were protectable under copyright law. Since copyright law preempts equivalent state law claims, the "hot news" misappropriation claim was not available. The Lanham Act claim failed as well. The court, discussing the U.S. Supreme Court's Feist opinion, which rejected the "sweat of the brow" doctrine and required a modicum of originality to qualify for copyright, found the analyst's opinions to satisfiy the originality test and thus be covered by copyright. So the plaintiff lost the application for a default, but was granted the gift of learning that its activities are protected by copyright law. In Copyright Litigation Handbook, Chapter 7 "Drafting the Infringement Complaint" gives some thoughts on framing copyright pleadings. Chapter 10: "Removal from State Court and Preemption" reviews problems raised by the preemption doctrine and gives guidance in navigating the differences between state and federal claims in the copyright context. The 2010 Copyright Litigation Handbook just shipped, so now is a good time to get your copy. This year I greatly expanded my treatment of applications for default judgments, which seems to be a growing area of copyright law. Westlaw users can access Copyright Litigation Handbook through the COPYLITIG database. More on hot news here. More on default judgments here. In In re Outsidewall Tire Litigation, 2010 WL 2929626 (E.D. VA July 21, 2010), the court considered the question of whether a U.S. copyright owner could collect for infringements in China. The court found that the Second and Ninth Circuits had permitted such recoveries where a predicate act of infringement had occured in the United States. Here, a copyrighted tire design was copied in the U.S. then transported to China, where it was exploited. The court permitted recovery of profits (not actual damages), even though the initial act of infringement fell outside the statute of limitations. The court noted that both the Second and Ninth Circuits had permitted recoveries under similar circumstances and upheld the jury verdict. The issue arose in the context of a motion pursuant to Rule 50 of the Federal Rules of Civil Procedure to determine whether the evidence adduced at trial was sufficient to support the jury's verdict. A motion for judgment as a matter of law may be made at any time before the case is submitted to the jury. The motion must specify the judgment sought and the law and facts that entitle the movant to the judgment. (b) Renewing the Motion After Trial; Alternative Motion for a New Trial. (2) Effect of a Conditional Ruling. Conditionally granting the motion for a new trial does not affect the judgment's finality; if the judgment is reversed, the new trial must proceed unless the appellate court orders otherwise. If the motion for a new trial is conditionally denied, the appellee may assert error in that denial; if the judgment is reversed, the case must proceed as the appellate court orders. (d) Time for a Losing Party’s New-Trial Motion. Any motion for a new trial under Rule 59 by a party against whom judgment as a matter of law is rendered must be filed no later than 28 days after the entry of the judgment. (e) Denying the Motion for Judgment as a Matter of Law; Reversal on Appeal. If the court denies the motion for judgment as a matter of law, the prevailing party may, as appellee, assert grounds entitling it to a new trial should the appellate court conclude that the trial court erred in denying the motion. If the appellate court reverses the judgment, it may order a new trial, direct the trial court to determine whether a new trial should be granted, or direct the entry of judgment. In Teter v. Glass Onion, Inc, 2010 WL 2945520 (W.D. Mo. July 22, 2010), the court considered a motion pursuant to Rule 37(c) of the Federal Rules of Procedure to exclude from evidence images culled from the internet and Internet Archive after the discovery cutoff. (e) Supplementation of Disclosures and Responses. In Teter, the plaintiff requested all documents that were to be used at trial during a formal discovery request. (c) Failure to Disclose; to Supplement an Earlier Response, or to Admit. (1) Failure to Disclose or Supplement. In this case, the materials were provided 20 days after the close of discovery. The court found that the images were publicly available to both sides from a public domain source, the adversary could not possibly be prejudiced. I cover Discovery in Chapter 14 of the Copyright Litigation Handbook. Not every judge takes Teter's common-sense view. And Teter should not be seen as a free pass from a discovery cut-off. When discovery has already been produced and new materials come in, scan the new materials, privilege review/redact/log them, and get them out right away with a cover letter saying you are supplementing pursuant to Rule 26(e). Not every judge will permit documents produced after a discovery cutoff to be used in a trial. The Second Circuit Court of Appeals ruled today in a case involving the Estate of Fritz Grunbaum. A Massachusetts inventor and sculptor named David Bakalar purchased a drawing taken from Grunbaum while he was in the Dachau Concentration Camp, where he was murdered by the Nazis. The decision is below. The Second Circuit concluded that the trial judge erred by applying Swiss, rather than New York law, to determine title to an artwork located in New York. I was lead trial counsel at the district court level and argued the appeal to the Second Circuit. Fritz Grunbaum's art collection made headlines when D.A. Robert Morgenthau seized Egon Schiele's Dead City from the MoMA in New York City. 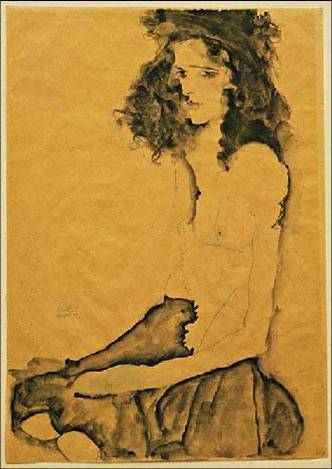 At the same time, Morgenthau seized Egon Schiele's Portrait of Wally, which was also stolen. Portrait of Wally was returned by Austria this summer. The Grunbaum heirs are waiting on Austria to make a decision on whether or not to return Dead City and the other artworks stolen from Fritz Grunbaum that are now in the Albertina and Leopold Museums. Austria has promised to issue a report soon, and then The Austrian Commission for Provenance Research is expected to rule. 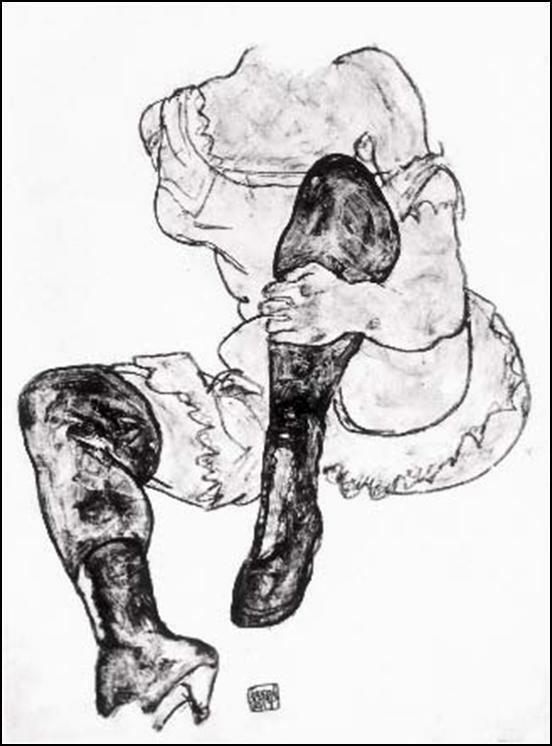 Oberlin College has steadfastly refused to share its provenance research into Black Girl, another work stolen from Fritz Grunbaum while he was in Dachau. 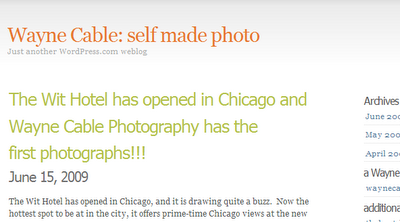 Oberlin's provenance page here. If American researchers and academic institutions like Oberlin won't be honest about the Nazi provenance of the artworks in their collections, why should we expect better of Austria? More on Oberlin's falsified provenance of Black Girl here. More on Fritz Grunbaum here. More on Egon Schiele here. In Cable v. Agence France Presse, 2010 WL 2902074 (N.D. Ill. July 20, 2010), a photographer sued Agence France Presse for violations of the Digital Millenium Copyright Act 17 USC 1202 and the Lanham Act. The violation alleged was that AFP removed the photographer's name, copyright notice and a "hotlink" to his website that were embedded in the photographs, then resold or reused the photographs. AFP moved to dismiss, claiming that the photographer's name, copyright notice and hotlink were not "copyright management information" as intended by the DMCA. AFP argued that "copyright management information" referred to copyright management performed by technological systems. The court rejected AFP's argument and declined to dismiss the claim based on a DMCA violation. The court also upheld a Lanham Act claim based on the same facts, finding that a claim for "reverse passing off" had been alleged, relying on the Supreme Court's Dastar case. (2) distribute or import for distribution copyright management information that is false. (4) With the exception of public performances of works by radio and television broadcast stations, the name of, and other identifying information about, a performer whose performance is fixed in a work other than an audiovisual work. (5) With the exception of public performances of works by radio and television broadcast stations, in the case of an audiovisual work, the name of, and other identifying information about, a writer, performer, or director who is credited in the audiovisual work. (6) Terms and conditions for use of the work. (7) Identifying numbers or symbols referring to such information or links to such information. (8) Such other information as the Register of Copyrights may prescribe by regulation, except that the Register of Copyrights may not require the provision of any information concerning the user of a copyrighted work. More on the DMCA here and here. Woods v. Resnick, 2010 WL 2814414 (W.D. Wis. July 16, 2010) involved two men who were members of an LLC. One was the "idea guy". The other was a software programmer who worked from home. The "idea guy" claimed that he owned the software. He hired an expert to show that he'd made independently copyrightable contributions, which is one of the requirements of joint authorship. The court disregarded the expert's findings in part because the expert was not an expert in copyright law and found that the "idea guy" had supplied only some non-copyrightable formulas. The software programmer worked at home, was the only one with access to the source code, worked independently, and importantly, never signed a work for hire agreement. The court considered cross-motions for summary judgment. From the decision, it does not appear that either party registered any claims with the Copyright Office. The court found the software programmer to be the "sole author" of the software program and thus the owner. The court rejected the argument that the representations and warranties contained in service agreements to licensees that the LLC owned the copyright were sufficient to create an assignment satisfying 17 USC 204(a). More on joint authorship here. More on work for hire doctrine here. More on assignments of copyright here. More on declaratory judgments here. The race for New York's Attorney General is an important one. Eric Schneiderman is by far the outstanding candidate in the race, and his endorsement by the New York Times is a real stamp of approval. His fundraising efforts are bearing fruit and his is moving towards the September 14 primary as the "man to beat". "It was a mistake, and I readily admit that,” said Rice. “And I spend a lot of my time now speaking to young people and encouraging them not to make the same mistake I did." A Rice spokesman later added that, until now, the candidate actually never brought up her own personal voting story in those speeches. Although it was the mistake of not voting that has encouraged her to speak to students about the importance of heading to the polls. How does one "mistakenly" not vote for 18 years? According to NY 1, Rice registered as a Republican in 1984. For some of us, watching who gains the support of Sheldon Silver is an important determinant in voting. Rice has the backing of Sheldon Silver's law firm Weitz & Luxenburg, who according to the New York Times is "pouring money into the campaign" of Rice (Weitz accounted for 12% of Rice's total donations). And when one sees "Republican" and "Nassau County" in someone's resume, one can't help question whether New York's greatest kingmaker, former Sen Al D'Amato, had a hand in the pick. Was D'Amato's getting to pick Rice the price of D'Amato's support of Andrew Cuomo in the gubernatorial race? According to Newsday, D'Amato attended a Rice fundraiser and has thrown his backing behind Cuomo. The last thing New York needs is for its Attorney General to be a puppet of Sheldon Silver. Here is one reason why those who are skeptical of putting the AG's office into Silver's hands should turn out in droves to support Schneiderman. In the last redistricting battle, Sheldon Silver took Schneiderman's Upper West Side district away from him. Redistricting is the ultimate Albany battle, where kingmaker Silver rewards friends and punishes enemies. Silver redistricted Schneiderman into Washington Heights, confident that Schneiderman would be defeated in the coming election. To his credit, Schniederman fought back, ran an effective grassroots campaign and crushed his adversary. Albany is a cesspool. But Schneiderman, today still serving as State Senator bucked the trend, heading a committee that pushed the expulsion of Hiram Monserrate. Eric Schneiderman deserves our support. Contribute to the Schneiderman campaign here. Today's digital world relies increasingly on works of fine art. Fine art and the creative process relies on appropriation, mimicry, satire, parody and collage. How does the Copyright Act and the Visual Artists Rights Act fit in? What materials can an artist use? To what degree may an artist protect the integrity of artworks? How does anyone make money? This lively and entertaining program considers case law involving works of fine art to illustrate current controversies in copyright law that affect painting, sculpture, architecture, photography and video. The principles considered, such as "work for hire" and the "fair use doctrine" apply to all creative and commercial endeavors that use copyrighted materials and should be of interest to those in intellectual property, business law, employment law and litigation. Raymond Dowd is a member of Dunnington Bartholow & Miller's intellectual property, art law, corporate, litigation and arbitration practice groups. He has broad commercial litigation experience in both federal and state courts, and has represented copyright, trademark and domain name owners, broadcasters, distributors and content providers in transactions and litigation, representing both plaintiffs and defendants. Mr. Dowd represents collectors and dealers of fine art and has litigated disputes involving authenticity, forgery, ownership and provenance. Mr. Dowd regularly speaks to trade associations on copyright, fine art, trademark and litigation issues, and participates in organizing continuing legal education programs. His 2009, Copyright Litigation Handbook (West 2010), was called "an indispensable guide" by The New York Law Journal. The All Intellectual Property Analytical Database on Westlaw which contains such classics as McCarthy on Trademarks now contains Copyright Litigation Handbook. If your firm or law school subscribes to this library, you can access the Copyright Litigation Handbook 2010, which just shipped last week, by typing database identifier COPYLITIG into Westlaw. For more information about Copyright Litigation Handbook 2010, plus detailed information on its contents, see my last blog post here. Here is a list of the contents of the All Intellectual Property Analytical Database on Westlaw. JCPS Journal of the Copyright Society of the U.S.A.
My publisher West has informed me that Copyright Litigation Handbook 2010 is now being shipped. This year there's been a tremendous number of developments in copyright law, dealing with the Copyright Office, and the relevant Federal Rules of Civil Procedure and keeping up has been a tremendous task. The Copyright Litigation Handbook 2010 contains a full text of the Copyright Act 17 USC 101 et seq, the Copyright Act of 1909, the Federal Rules of Evidence and the Federal Rules of Civil Procedure. That means that it's a quick and easy desk reference. It contains checklists, forms and updated case citations. 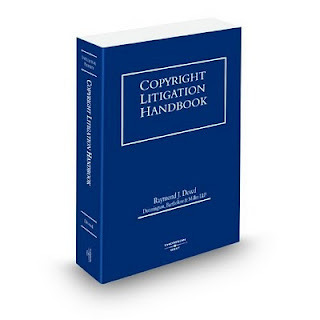 Unlike other books on copyright law, the Copyright Litigation Handbook aims to help copyright law practitioners figure out how to deal with the unique procedures arising from handling a copyright case, from pre-and post-litigation interactions with the Copyright Office through handling every aspect of a litigation that may arise in dealing with the federal courts. It will help both beginners and experts. No other book out there tries to help you figure out how to get these problems resolved in a practical way. Since the first version of Copyright Litigation Handbook was published in 2006, the content has expanded over 60%, reflecting the addition of new chapters, new sections and expanded case coverage. The Copyright Litigation Handbook is designed for attorneys who must navigate the issues from the first client interview, through a trial and final appeal. You can find a detailed summary of Copyright Litigation Handbook's contents here. 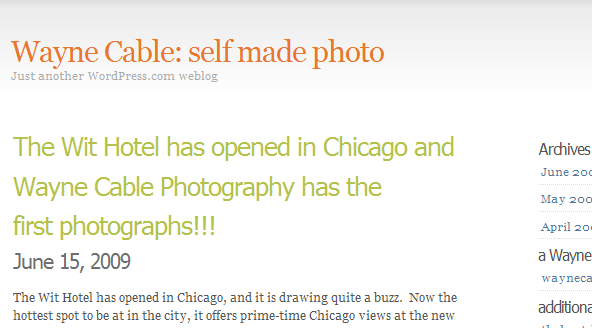 For some more information on me from the West Expert Directory, check here. Practitioners who subscribe to Westlaw can access Copyright Litigation Handbook through the database COPYLITIG. If your law firm has the All Intellectual Property Analytical Database on Westlaw, COPYLITIG is included. More information on the scope of COPYLITIG here. I believe that law students get free subscriptions as part of a student account at law school. For student discounts, copyright law professors and law librarians please contact your West rep.
Raymond J. Dowd, an experienced trial lawyer and partner with Dunnington, Bartholow & Miller LLP, has written a long-overdue work. His Copyright Litigation Handbook provides a straightforward overview and is chockablock with insightful and practical information. Mr. Dowd is liberal in his inclusion of excerpts from relevant statutes, including not only the Copyright Act, but also the Federal Rules of Civil Procedure and the Federal Rules of Evidence, and his book provides numerous sample forms. Mr. Dowd's Copyright Litigation Handbook will long be a valuable resource for copyright litigators; I am confident that it will be squeezed into trial bags for years to come. David Wolfsohn, Woodcock Washburn LLP. A major international issue is whether a government can purchase a pile of stolen art and then claim immunity under the Foreign Sovereign Immunities Act 28 U.S.C. 1604 when it then makes the stolen art a tourist attraction and markets it to Americans. Under U.S. law, receiving stolen property is a crime. 18 USC 662. Spain scored a cultural coup in the 1990's by purchasing the tainted Thyssen-Bornemisza Collection which was compiled by a famous Nazi family. Spain put the art collection into a "foundation" and tried to insulate it from claims from an American Jew named Claude Cassirer whose grandmother Lilly had been spoliated by the Nazis in the widely-reported case Cassirer v. Kingdom of Spain. Austria did this by creating the "Leopold Foundation" to "own" the Leopold Museum. These "foundations" are legal fictions set up to shield the stolen art from legal claims in violation of international law. Creation of the Leopold Foundation violates the Austria State Treaty Article 26 which unconditionally requires Austria to return property stolen from Nazi persecutees. Art 26 has no time limitations and is a continuing obligation that Austria has spent decades avoiding, with the complicity of the U.S. State Department. More on Rudolph Leopold and the Leopold Foundation here. Rather than treating Rudolph Leopold as the serial criminal that he was, purchasing stolen property and laundering provenances over the course of decadek, a fawning international art press lionizes him as a "collector" downplaying the facts that he died on theeve of his criminal trial in the U.S. in the Portrait of Wally case. The late collector Heini Thyssen forced himself to forget his family’s Nazi involvement, but so did the countries that vied for his and his father’s pictures in the 1980s. This well documented book gives the details. It was the Allies themselves, especially the Americans, who decided to let bygones be bygones and help revive the Thyssen empire in the interest of the German economy and opposing the Soviets. Before Berlin was even taken, Thyssen Gas and Water was working with the Allied Military Governor and by 1948, Bremer Vulkan, the Thyssen shipyard that had made U-boats for the Nazis, had orders from the Allies worth DM11.25m. The fact that in 1946, Averell Harriman, who in January 1941 still nominally held the Thyssen shares in their BVHS bank, became Secretary of State for Commerce almost certainly helped the family get back their banking assets. Forty years pass and in 1986 the word gets out that Heini Thyssen is thinking of moving his collection from the Villa Favorita on Lake Lugano. Countries fall over themselves to get hold of it (including Prime Minister Thatcher—the only time she takes a direct interest in the arts) and the Nazi past never gets mentioned. As Heini intended from the outset—because it was what his new Spanish wife, Tita, wanted—Spain wins, and in 1993 pays $350m for half the collection. In addition, Heini’s brother Stephan, who remained in Germany during the war, was chairman of the board of MABAG, a company that sank mine shafts, built machinery, including parts for the V1 and V2 rockets that bombed Britain, and built petrol storage installations. Together with IG Farben, it constructed the Reich’s main fuel-storage depot in the Kohnstein mountains. By the end of 1943 there were more than 10,000 forced labourers living underground and by October 1944, it had become a concentration camp in its own right, Mittelbau, which would hold 60,000 prisoners of whom 20,000 were worked to death. In addition, a US government memo in the Washington Archives says that in 1943, one in two miners in the Thyssen’s Walsum mine was a slave labourer. So it's a good thing that on August 12, 2010 the Ninth Circuit decided en banc that Spain's Thyssen-Bornemisza Collection Foundation is not immune from suit in the United States under the Foreign Sovereign Immunities Act (FSIA) 28 USC 1605. The Ninth Circuit decided two good things: 1. that Claude Cassirer was not required to "exhaust" his remedies against Spain in a Spanish court prior to bringing a claim in the US and 2. that Spain's possession of expropriated property together with its commercial activities in the US (e.g., selling pictures of the stolen work to American consumers) exempted Spain from claiming sovereing immunity to suit. Below is the YouTube video where attorney Thad Stauber of Nixon Peabody gives the Ninth Circuit's panel a "shout out" from William Barron of Smith Gambrell, who represents both Thyssen-Bornemisza and the Leopold Foundation in the Portrait of Wally case. The argument is really worth watching, kudos to the judge who analogizes the case to the "pawn shop" scenario.